Aeroflot may be privatized slower than it was proposed in the plan drawn up by the Federal Property Management Agency. A presentation made by the airline affirms that a rapid withdrawal of the state from its capital will turn Aeroflot into a regional player. New timelines for the privatization of Aeroflot are described in the materials that the airline prepared for expert hearings on the “road map” of Aeroflot privatization. Withdrawal of the state from Aeroflot’s capital should be carried out in two stages. 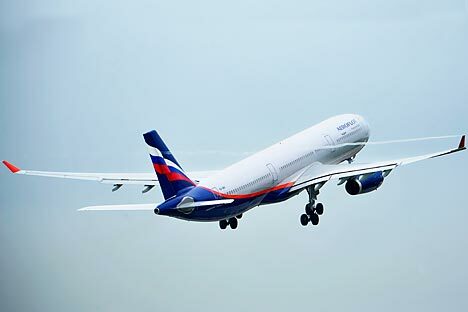 In the first stage (2013–2015), it is necessary to complete the integration of the regional Rostech companies into the Aeroflot Group, create a low cost carrier, and so on. It will then be possible to reduce the government's stake in the airline from 51.17 to 50 percent plus 1 share, and to increase the number of publically traded shares to 40 percent, by placing an additional 10.55 percent of the shares (3.55 percent from Rostech, treasury shares of 4.66 percent, and an additional issue of 2.34 percent). On the Moscow Stock Exchange, 10.55 percent of Aeroflot was worth 6.48 billion rubles ($203 million at current exchange rates) in late October. The state's interest dropping to 25 percent plus 1 share is proposed only for the second stage, in 2016–2020. The decision on the form and timing of the second stage should be made in 2015. According to the privatization plan forecast published by Federal Property Management Agency, the state's share in Aeroflot must be reduced to a blocking package by 2016. A representative of Aeroflot assured that the “road map” has been approved by the Federal Property Management Agency. A representative of the agency, however, was not available for comment. Savelyev believes that the shares should be sold only when the company is at the peak of capitalization; currently, Aeroflot is undervalued by 30–50 percent, said a source close to Aeroflot. It would be wrong if the bonus from a further increase of capitalization was obtained by the buyer and not the state, as the current owner, the source told Vedomosti. Aeroflot backs up its position with an analysis of international experience. International airline companies, developing on the “national carrier” scenario, are characterized by “a global presence, turbo-growth and management of several brands.” These carriers create the “rules of the game,” and Aeroflot says these are Air France, Lufthansa, British Airways, and others. It is possible to achieve capitalization growth without major investments into the airline, notes Panteleyev. “It is a huge advantage for the Federal Property Management Agency not to invest a dime and be able to obtain capitalization growth of 40 percent,” the analyst says.